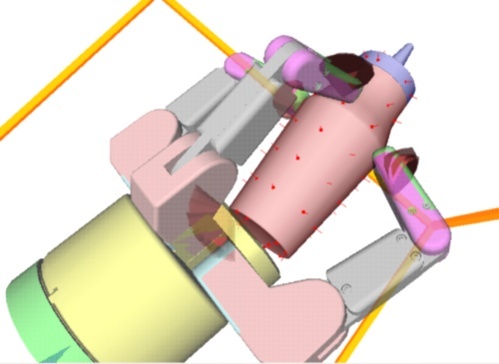 OpenRAVE can simulate grasps for any type of robotic hand, evaluate the quality of the grasps, and use those grasps in a more complex grasp planning framework. This tutorial is meant to introduce you to the grasper plugin and the scripts provided to manage the testing and simulation. At the end, you should be able to create grasp tables and use them effectively in OpenRAVE. 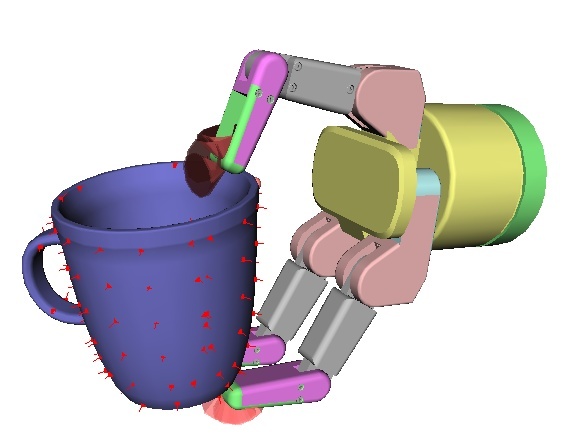 A grasp is simulated by giving the end-effector an initial pose and initial joint angles (preshape). Then the end effector moves along a direction (usually along the normal of the palm) until it hits the target object. Once hit, the ‘fingers’ of the end-effector slowly close around the object until they cannot close further. The contacts between the end-effector and target object are extracted, and force closure is calculated. The Grasper - grasper is responsible for this simulation, the scripts just pass in the correct parameters to it. Grasp set creation first tries to uniformly sample the surface of the object to determine where to the approach directions should be. 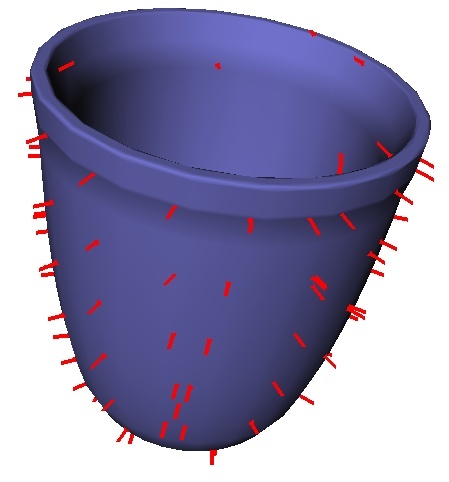 Sampling the actual geometric surface of the object can lead to unwanted results due to possible concavities like the handle of a cup. 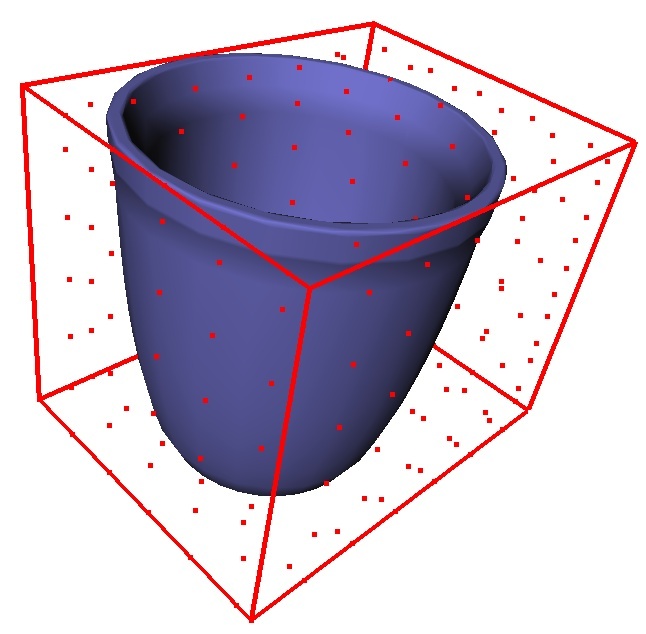 A simpler approach is to take the bounding box of the object and sample its surface uniformly (see GraspingModel.computeBoxApproachRays ). Once the surface of the box is sampled, the intersection of the object and a ray originating from each point going inward is taken. The normal of the object’s surface from each of these intersection points is taken to be the approaching direction of the end-effector. 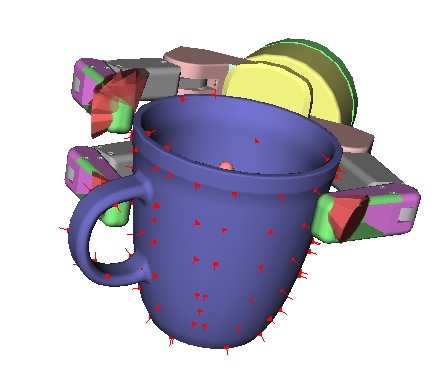 The red lines in the above image indicate the rays along which the end-effector will approach the cup. Once the initial pose, preshape, and approach direction are chosen, the grasper planner is called, which queries the contact points of the grasp and analyzes them for force closure. 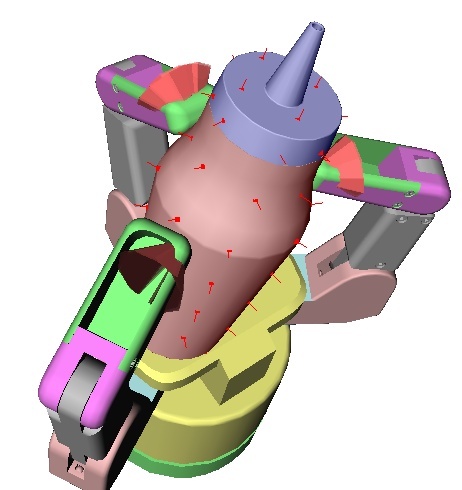 Render the final configuration of the end-effector closing down on the target object along with the friction cones at each contact point (red transparent cones). Calling GraspingModel.generate generates tables for a ketchup bottle. the grasper problem has two functions: grasp and computedistancemap. grasp just takes care of filling the parameters structure for the planner and returning contact points. All grasp parameters like roll, direction, and center offset now specified in target body space. The user never has to transform them correspondingly anymore (this was causing many headaches before). The grasp coordinate system is defined to be the manipulator’s grasp coordinate system (ie, it isn’t a link). This allows grasps to define a center of approach. Each grasp also requires an approach direction, which can be specified by the manipulationdirection parameter; if none specified, the manipulator’s direction is used. Because the grasper planner reads the gripper links from the manipulator definition, it can now function correctly just by being passed the full robot. Inside the loop, the gripper is separated momentarily to complete the grasping process, the rest of the body is ignored. This allows users to test grasps on a real scene without having to introduce a floating hand into the scene. Grasp set generation example for any robot/body pair. Returns the set of grasps that satisfy conditions like collision-free and reachable. returnnum – If set, will also return once that many number of grasps are found. backupdist – If > 0, then will move the hand along negative approach direction and check for validity. checkgrasper – If True, will execute the grasp and check if gripper only contacts target. checkik – If True will check that the grasp is reachable by the arm. checkcollision – If true will return only collision-free grasps. If checkik is also True, will return grasps that have collision-free arm solutions. Generates a grasp set by searching space and evaluating contact points. returns the final grasp transform before fingers start closing. If collisionfree is set to True, then will return a grasp that is guaranteed to be not in collision with the target object when at its preshape. This is achieved by by moving the hand back along igraspdir. squeeze the fingers to test whether the completed grasp only collides with the target, throws an exception if it fails. Otherwise returns the Grasp parameters. Uses the grasp transformation directly. Returns an iterator for valid grasps that satisfy certain conditions. See computeValidGrasps() for description of parameters.